As the 2018 Atlantic hurricane season draws to a close at the end of November, it’s a good time to reflect on how one of the most disruptive periods of the year is affecting supply chain risk planning. If there were one lesson for procurement to learn from the past season, it’d be this: Hurricanes are becoming more powerful and lasting longer. The last several years of intense storms (think Harvey, Irma, Maria, Florence and Michael) are not anomalies but what appears to be the new normal. Businesses must therefore take stock of the new standards for natural disasters and prepare accordingly — or risk being caught off-guard. Data analyzed by the Guardian indicate that the number, length and intensity of Atlantic storms are set to worsen in the long term. Meteorologists use the accumulated cyclone energy (ACE) index to measure the strength, frequency and duration of storms in a year. Since 1900, there have been 42 hurricane seasons with above-normal ACE. Sixteen of those seasons, or 38%, have occurred within the last 24 years, the worst stretch on record. The damage from a supply chain perspective is easy to see. During 2017, the Atlantic saw 10 hurricanes form rather than the average six. The three most powerful — Harvey, Irma and Maria — cost the U.S. a combined $265 billion. Ports were closed for weeks and truck fleets were strained by the dual need to serve customers and disaster relief efforts, to say nothing of the human toll the storms caused. While 2018 was not as bad as last year, it still thwarted forecasters’ expectations. The presence of the El Nino effect on the Atlantic this year caused NOAA to reduce the number of hurricanes predicted, yet the storms that did form exceeded the “below normal” activity expected. Hurricane Florence lashed the Carolinas and shut down auto production there for days, while Hurricane Michael targeted the Florida panhandle and wiped entire beachfront towns off the map. One of the reasons both years were so catastrophic was the phenomenon of rapid intensification, where a storm increases its maximum sustained winds by at least 35 mph within a 24-hour period. Last year saw 40 cases of rapid intensification, the highest number since 1982. Hurricane Maria was one such storm, transforming from a Category 1 hurricane into a Category 5 in less than 24 hours. 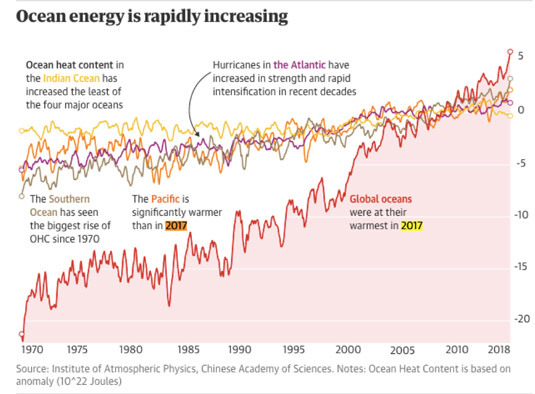 As global ocean temperatures, especially in the Atlantic, continue to rise, cases of rapid intensification are expected to increase. This is particularly concerning for supply chain planning, as it leaves little time and warning to enact contingency plans. So even in a year with fewer storms, a seemingly safe situation can rapidly shift into a crisis. Unless procurement has the tools and strategies to react or be prepared. When it comes to planning for more intense and erratic Atlantic hurricane seasons, there are three key efforts procurement can make to support agile supply chain planning. First and perhaps most fundamental is gaining deep visibility into lower levels of the supply chain and how they could be affected by severe weather. While many companies have a decent picture of who their tier 1 suppliers are and where they have operations, the sub-tier details (i.e., the suppliers of those suppliers) are often much less clear. When Hurricane Harvey struck Texas, for example, 33% of total U.S. chemical production was disrupted, as there were 68 chemicals that could be mapped to Texas manufacturing sites that fed multiple industries. Even if a tier 2 supplier produces components or ingredients in a location far from at-risk Atlantic regions, if it needs raw materials from suppliers affected by hurricanes, companies farther downstream are still likely to suffer. With that data in hand, procurement must then establish a disruption management team and foster the correct channels to communicate necessary mitigation strategies to corporate risk councils. Bridging information and functional gaps between various departments (e.g., logistics, supply chain and procurement) is essential to speeding up response time, and the final team must have clear, established roles for each individual. Winning buy-in to make critical decisions from company leaders in times of disruption can also streamline the disaster response for organizations. Does our organization have any upstream or downstream dependencies that this storm could affect? Are there any single-sourced components that we need to diversify in case of an event? What alternate sources of transportation or routes could we use if our primary option is eliminated? Could we shift supply out of an affected region to somewhere else that can keep the production schedule on track? Could inventories at sites outside of the affected area handle production needs? For how long? What suppliers are particularly vulnerable, and how could we help them plan for recovery? How could the event cause demand fluctuations, and how does that play into production needs? This of course requires procurement to have early notice of when a storm could potentially disrupt supply chains. Services like Resilinc’s EventWatch platform use artificial intelligence to monitor any events that could affect supply chains and predict how an event could impact suppliers and sites. Resilinc tracks millions of sources — from news sites to social media and regulatory agencies — to give users the earliest notice possible, providing up-to-date guidance as events evolve, which is critical for the era of rapid hurricane intensification that procurement faces. This article was written on behalf of Resilinc by the Spend Matters Brand Studio team, not as Spend Matters editorial content or the analyst teams' insight.